1675: Buzaemon performs in Edo for the zamoto Ichimura Takenojô I. 1681: Buzaemon goes back to Kyôto. 2nd lunar month of 1683: Buzaemon goes to Edo and achieves a great success at the Moritaza by playing in the drama "Saigoku Tomitagahara". 1685: Buzaemon goes back to Kyôto. 1st lunar month of 1691: Buzaemon achieves a great success in Kyôto by performing the jitsuaku role of Abe no Munetô for the Murayama Heiemon II. Summer 1693: Buzaemon plays in Kyôto at Hayagumo Chôdayû's theater in the drama "Kôshoku Denju". Fall 1693: Buzaemon goes to Edo. 1695: Buzaemon goes back to Kyôto. 8th lunar month of 1697: Buzaemon achieves a great success in Kyôto at Miyako Mandayû's theater by playing the role of the priest Kisen in Chikamatsu Monzaemon's drama "Momoyo Komachi", which is produced by Sakata Tôjûrô I. 1698: Buzaemon goes to Ôsaka. 6th lunar month of 1698: Buzaemon plays in Ôsaka the role of Mareyo in the drama "Semimaru Nido no Shusse", which is produced by Iwai Hanshirô I. 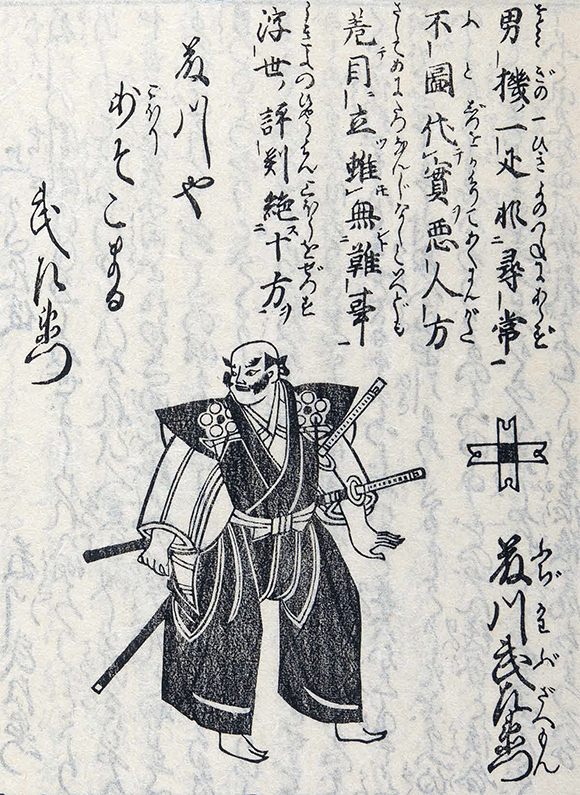 His stage partners are Asao Jûjirô (Kita no Kata), Iwai Hanshirô I (Kiyotsura), Yamashita Matashirô I (Senju Tarô), Shinozuka Jirozaemon (Sakagami no Ôji), Uemura Takenojô (Semimaru), Mihara Jûdayû I, Ogura Bun'emon and Uemura Kichisaburô. Fall 1698: Buzaemon goes back to Kyôto. 1st lunar month of 1699: Buzaemon plays at Miyako Mandayû's theater in Chikamatsu Monzaemon's drama "Keisei Hotoke no Hara", which is produced by Sakata Tôjûrô I. 3rd lunar month of 1699: Buzaemon's rank in the Kyôto hyôbanki, katakiyaku section, is jô-jô-kichi (superior - superior - excellent). Fall 1709: Buzaemon goes to Edo. 1st lunar month of 1710: Buzaemon plays at the Moritaza in the new year drama "Kaishun Soga". Fall 1710: Buzaemon goes back to Kyôto. 11th lunar month of 1710: Buzaemon plays in Kyôto at Ebisuya Shôdayû's theater in the kaomise drama "Inari Chôja Yotsugimaru", which is produced by Yamashita Karumo. His stage partners are Yamashita Kyôemon I, Yoshizawa Ayame I and Sawamura Chôjûrô I. 1st lunar month of 1712: Buzaemon achieves a great success in Kyôto at Hoteiya Umenojô's theater by playing in the new year drama "Keisei Miidera no Kane", which is produced by Sakakiyama Shirotarô I. 11th lunar month of 1714: Buzaemon plays the role of Sagami Nyûdô in the kaomise drama "Azuma-zukuri Ôdaidokoro", which is produced at Kameya Kumenojô's theater by Sakakiyama Shirotarô I. 11th lunar month of 1717: Buzaemon plays in Kyôto the role of Shinohara Jibudayû in the kaomise drama "Genjôraku Biwa no Ôumi", which is produced by Yamatoyama Jinzaemon I in Ebisuya Kichirôbê's theater. 11th lunar month of 1718: Buzaemon plays in Kyôto at Ebisuya Kichirôbê's theater the role of Shigaraki Daiemon in Adachi Saburôzaemon's kaomise drama "Shiga no Miyako Kogane no Hanazono", which is produced by Yamatoyama Jinzaemon I. Because of his old age, his voice is no more full of life and he can't talk for a long time any more. 11th lunar month of 1719: Buzaemon plays at Hayagumo Chôdayû's theater the role of Kagamiyama Kageyu in the kaomise drama "Chiyo no Ume Naniwa Kagami", which is produced by Sakakiyama Shirojûrô. This is the first stage appearance of his grandson Fujikawa Heikurô. 1st lunar month of 1721: Buzaemon falls ill and has to rest. His rank in the Kyôto hyôbanki, jitsuaku section, is goku-jô-jô-kichi (extreme - superior - superior - excellent). 11th lunar month of 1721: Buzaemon appears on stage for the last time, in Kyôto at Hayagumo Chôdayû's theater, playing in the kaomise drama "Fuji Asama Taiheiraku", which is coproduced by Wakaura Kinjûrô and Matsumoto Shigemaki. 11th lunar month of 1723: Buzaemon's name is on the playbill of the kaomise drama, which is produced by Arashi Sanjûrô I at Ebisuya Kichirôbê's theater. He most likely does not appear on stage. 3rd day of the 3rd lunar month of 1729 : Buzaemon dies in Kyôto. Fujikawa Buzaemon I was an outstanding katakiyaku and jitsuaku actor, who was endowed with a powerful voice and was active on stage for a very long time (most likely more than 6 decades). He was considered as the first jitsuaku in Kabuki history. He was also the founder of the Fujikawa clan. His longevity was exceptional for he died at the age of 98! The 3rd day of the 3rd lunar month of the 14th year of the Kyôhô era was the 31st of March 1729 in the western calendar.